Following a nutritional diet and fitness regimen is one of the best ways to develop and maintain a healthy, fit physique. However, if you’ve been eating right and exercising regularly but still can’t reduce pockets of stubborn fat, our experienced dermatologist, Dr. Deborah Atkin, may be able to help. UltraShape® Power, the latest non-surgical fat reduction system, typically offers excellent results quickly, safely, and comfortably without the need for invasive measures. Originally developed in Europe and recently FDA-approved in the U.S., UltraShape® Power may be your solution for resistant fatty tissue on the abdomen, thighs, flanks, and troublesome areas. 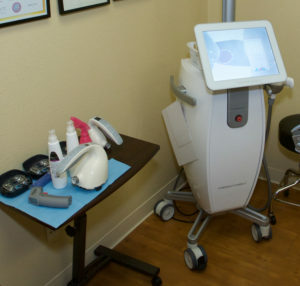 Dermatology & Laser of Del Mar is proud to be the first practice in the area to offer this state-of-the-art non-surgical body contouring option. 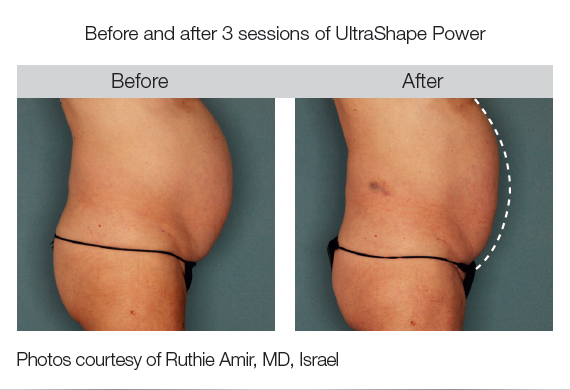 UltraShape® Power can provide comfortable, non-surgical fat reduction in less time and with 20% more power than before. Many people experience measurable circumference reduction, many reporting as much as a 32% reduction in the treated area after just three sessions. Other benefits of this technique include a shorter treatment time and greater control, precision, and consistency throughout the procedure. It’s also worth noting that UltraShape® Power has no body area shape or size restrictions. Once UltraShape® Power therapy is complete, there will be no visible signs of undergoing treatment. After the procedure, you will be able to return to your normal routine right away. Want to know more? Talk to our medical team today for more details on this exciting body contouring system. Did You Know?Did you know over 300,000 UltraShape treatments were performed worldwide with outstanding patient satisfaction. Average circumference reduction ranges from 3.3 to 6.3 cm? During your initial consultation, your aesthetic goals and areas of concern will be discussed to develop a customized treatment plan. UltraShape® Power can be performed on the stomach, flanks (love handles), and thighs, as well as other body regions, including the upper arms and buttocks. This method is excellent for both small, discreet bulges that have been diet and exercise resistant and larger bulges in need of de-bulking. The combination of a handheld device and a camera, UltraShape® Power technology allows your UltraShape® Power provider to focus the ultrasound energy into specific areas where stubborn fat resides. You should feel minimal discomfort during the procedure. Depending on your cosmetic goals and unique anatomical indicators, you may require between one and three treatment sessions, on average, each occurring approximately one week apart. You should begin to see improvement after about two weeks, with full results visible a few weeks after your final treatment. There is no downtime following the experience. You should feel minimal discomfort during the procedure. For more information about UltraShape® Power, or if you wish to schedule a consultation with Dr. Atkin, please contact our office.